Yes, he said, smiling countless times. He was fine. The worry was over his troublesome left toe, which caused him to briefly leave Utah’s 116-108 Game 1 loss to the Oklahoma City Thunder. He went back to the locker room, got an X-ray which showed no fractures, then went back in for the fourth quarter. It was natural to be concerned. But after Sunday night, no one has questions about the Jazz rookie’s readiness for the playoffs. From the start of his 27-point, 10-rebound performance, Mitchell wiped away doubts — if anyone had any in the first place. The 21-year-old looked fearless early, scoring nine points in the first four-and-a-half minutes. He grabbed rebounds on the defensive end, then from his opening basket — a dunk — he hit a pair of floaters, and then a 3-pointer. Thanks much in part to Mitchell, the Jazz were up 16-4 before the Thunder awoke. 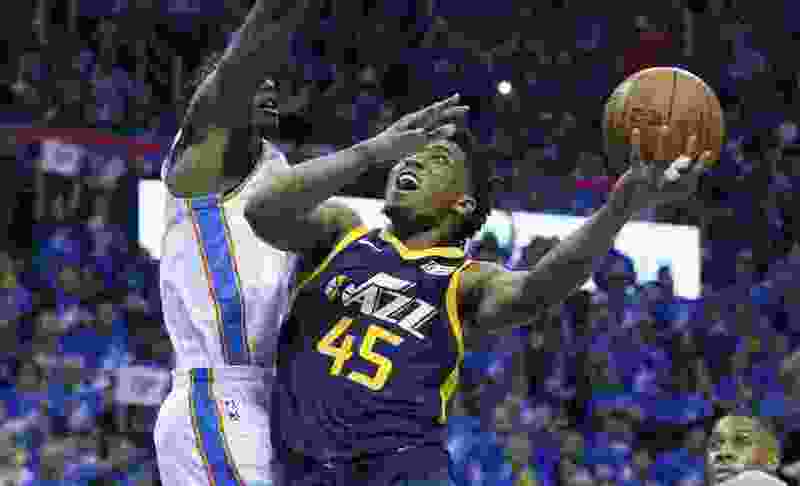 Mitchell was arguably the player keeping the Jazz alive in the third quarter, scoring 10 of his points and keeping the Thunder from pulling way ahead. But as he was playing some of his best basketball, he faced his biggest test. Mitchell claimed he “stubbed” his toe, and onlookers said he looked to be in great pain as he went to the locker room. Even after his X-ray came back clean, the coaching staff seemed skeptical. Cameras caught him shouting off one of the team trainers who came to examine his foot as he was sitting on the bench. Even Snyder pulled Mitchell aside during a brief sub-out to make sure he was OK. The rookie wasn’t having it. He subbed back in. Snyder said postgame that Mitchell will likely undergo more testing to make sure he’s healthy enough to play. But he made some late baskets that reassured his coach as well. Mitchell said the fourth quarter, in which the Thunder scored 35 points and led by as much as 18, showed him “what playoff basketball is gonna be like.” He (and the Jazz) felt there were positive takeaways to be had. It was somewhat notable who wasn’t waiting to talk to him after the game finished: Paul George, Russell Westbrook and Carmelo Anthony. While the trio famously cornered him on court after a December regular season game, this is the playoffs: To them, Mitchell has established himself as a worthy adversary. And you don’t mix friendly words with your adversary.